A body is found at Super Nova Con. Victim is Annabelle Collins - someone responsible for bringing life back to a canceled show called Nebula 9. She had created a fan experience and brought back some actors. Her body was found with a burn hole in it from a laser gun. Castle and Beckett track down the manufacturer behind the gun who had only sold one. It was sold to someone the victim hooked up with every convention and he had given it to her as a gift. Annabelle had asked a former star of the show, Stephanie Frye, to take part in the fan experience. Stephanie refused because she wanted to get away from the show and move on with her career. Castle accidentally fires the gun and they realize it lefts prints on your hand that can only be seen under UV light. They bring in the hookup, her partners, the main attraction for the show, and Stephanie. Stephanie had killed her because she didnt want the show becoming popular again and having to deal with it. She wanted to be a movie star and with Nebula 9 back on, she could never get away from it. Beckett was a huge fan of the show and even dressed up for conventions. I can't tell you how many times I've had dreams of being on this very ship. You have a Nebula 9 outfit? Permalink: You have a Nebula 9 outfit? 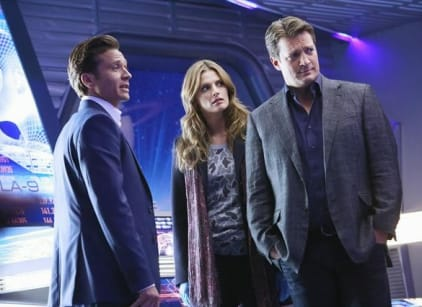 Castle Round Table: "Final Frontier"